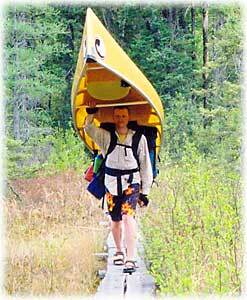 Accompanying you on your guided canoe adventure will be one of our experienced BWCAW canoe guides. Note: A 5 to 7 person trip will have two guides. Our guides assist you in sharpening your canoeing and camping skills-- plus they cook-up some of the finest trail meals you have ever experienced. Most importantly, our guides know the area: its history and lore, its wildlife and plants. You can expect that around the campfire at night they will share this wealth of knowledge with you. Special, guided day-trips to Rose Lake on the Canadian border are also available. Call us at 1-800-322-8327, 218-388-4487 or send an e-mail to bct@boundarycountry.com for more information or to make a reservation.